How Can I Prevent Rage Syndrome In My Cocker Spaniel? Cocker Spaniel Rage Syndrome Is Very Rare! Hi! Me and my family are going to get a cocker spaniel puppy and we don't want any aggression or anything in our dog. How can we prevent rage syndrome in our Cocker puppy? First of all - Cocker rage syndrome is the exception rather than the norm and although it's seen in Cocker Spaniels, it is very rare indeed. Many 'declared' cases of Cocker rage are nothing more than an aggressive, badly behaved, and/or poorly-trained Cocker Spaniel. If you'd like to read more about Cocker rage, you can do so here in our article which discusses rage syndrome in Cocker Spaniels. Of course you want a healthy Cocker with an excellent temperament, and to ensure this, I recommend you buy from a reputable breeder - our Cocker Spaniel Breeders directory may be able to help you locate one in your area. I urge you not to buy your puppy from a pet shop or a puppy farm (also known as a puppy mill) - puppy farms churn out puppies by the hundreds - they're like puppy factories. The dogs and puppies are not given much love or the care that they need and because of this, these puppies very often have health problems. 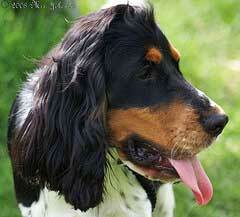 When looking for a good breeder, I recommend you ask lots of questions to check that they have the relevant experience and that they're a reputable cocker spaniel breeder. They will be expecting you to ask questions about their dogs and their puppies and they'll also want to know a lot about you too - so expect to be grilled! Here are a few ideas about the sort of questions you should be asking cocker spaniel breeders. Make sure you choose a breeder who breeds their puppies for that wonderful Cocker Spaniel temperament - that's always a good start! - but that's not the end to it. If you want a good temperament, it's also very, very important that you begin socializing your puppy as soon as you bring him home to ensure that he develops into a confident, well-mannered puppy and grows up to be a well-balanced adult dog with a great temperament. Please don't worry about Cocker rage, I promise you, it's not a common condition. If you follow the above advice it will take you a long way towards getting a Cocker Spaniel puppy with a great temperament! Good luck with your choice and enjoy your puppy. Comments for How Can I Prevent Rage Syndrome In My Cocker Spaniel? Yeah, just make sure you get a cocker spaniel with a good temperament - don't go to puppy farms or pet shops, and don't buy from friends! Treat your cocker gently, and don't shout at him because cockers can be quite sensitive and need gently but firm handling. Do this and you shouldn't have any problems!